A random collection of deep thoughts and shallow actions set in the Pacific Northwest early in the 21st century. Viewer discretion advised if sensitive to bad puns, hackneyed cliches, or rambling storytelling. And both have showed how to create your own way. And realized the adage, "Go West, Young Man"
The whisper of "Plastics" which became a big fad. My advice fit when I "wore a younger man's clothes"
But now it just causes most people to doze. Is to vow to refrain from offering direction. But they will always have my love and affection. The day dawned bright and clear, much like the futures of Sean & Evan, on the morning of May 21st, Sean's 30th birthday. Dianna, Merry, & I flew east on a red-eye through Detroit and back to Des Moines for Evan's graduation in Grinnell. We motored the 50 miles along I-80 in a light drizzle and caught up with Evan as he was handing in his last paper after staying up all night to finish it. I picked up a new Grinnell ball cap as my previous purchase from 45 months ago is, much like me, showing signs of wear. We ate at a nice local restaurant and got the tour of Grinnell which didn't take long since we only had to negotiate 4 square blocks. We left Evan & Merry who had a block party to attend and checked into our spartan but acceptable Super 8 motel 3 miles from campus and caught up on our rest from the red-eye. We tried to reach Sean for birthday greetings but missed him and will have to wait until he comes to Portland over Memorial Day for a show with the band. Saturday was relaxing and slow paced as we wandered around town on a warm and muggy day but was highlighted by some great music performances. A number of vocal ensembles performed in the Chapel, ending with a poignant ending by the G-Tones who paid tribute to a member who had passed away due to a pole vaulting accident the previous week. They created an award in his and another classmate honor and presented it to a current member. We then went to the Senioe talent show and were enetertained by 11 acts including juggling, dancing, and singing of which Evan popped up three times. He played keyboard on a Dylan song, guitar on a folk spiritual, "The Water is Wide", and keyboards on a Billie Holiday song, "God Bless the Child", all songs that are 45 years old or more.. I was able to record most of it on my camera for later viewing. Sunday we met Evan at his apartment and Dianna & Merry cleaned up the kitchen and dishes while Evan & I returned $20 in cans and bottles, the classic college savings account. Evan had backed some muffins and his girlfriend Mona had prepared a variety of foods for an evening potluck so he held an impronmtu picnic at the park next door. Evan had a reception for the Spanish department so I got to meet some of his classmates and his professors before he headed out to the potluck. Evan paraded across the stage about 11:30 AM, one of many graduates wearing a green ribbon denoting a commitment to “pledging to explore and take into account the social and environmental consequences of any job I consider and trying to improve these aspects of any organizations for which I work.” As the temperature rose, the black robed graduates faded but survived to toss their caps in the air around 12:30 CST. We celebrated at the picnic and joined the family of Mona and her brother Dean who also graduated. In one of those small world items, Evan and Dean had lived across the hall from each other freshman year. We went out for Mexican that evening and prepared to pack up and head home the next day. Tuesday morning provided us with a classic Midwestern thunderstorm and deluge, making us grateful for the dry weather of yesterday. We had a farewell breakfast at the A&M cafe, a classic greasy spoon housed in an old garage that my dad would have loved - I had biscuits and gravy in his honor. Mona & Evan's roommate Cecelia joined us and then we said farewell and thanks to Grinnell as we headed west to the airport, dropping Mona off at her house just north of Des Moines. Although the storms didn't reach the airport, our flight was slightly delayed and we didn't touch down in Portland until 8:00 PM where Rose was waiting with transportation. Seventy two years ago my dad hopped a freight train the day after Missouri graduation and headed west, eventually working in the CCCs just outside of Grants Pass, which set the stage for our permanent move to Oregon 20 years later. Thirty five years ago, the day after my Stanford graduation, I hopped in Ernie the truck, and headed north to Medford and got a phone call the next morning luring me to Portland where I have remained and can view all my work locations over the better part of 4 decades from my 17th floor office window. Evan hopped a plane and arrives back in Oregon with limitless possibilities and a resume of extensive world travel so stay tuned.... For now, he'll have time to decompress back home while he sorts through his options. It's a time honored tradition to offer graduation advice like that of Art Link letter who passed away yesterday at 97 - "Things turn out best for the people who make the best out of the way things turn out." or Emerson, "What lies behind us and what lies before us are tiny matters compared to what lies within us. “Or Robert Louis Stevenson, “Don’t judge each day by the harvest you reap but by the seeds that you plant. ", but on the plane ride a had an epiphany. I read an article about generational differences and as a Baby Boomer (1946-1964); I realize I have a much different world view than Sean, a Gen-Xer (1965-1981) or Evan, as a Millennial (1982-2000). Boomers, in general, having had the benefits of a post war expansion were provided with ample opportunities and the potential for "me" centered entitlement has led to some of our social and economic excesses. - We tend to want our life to have meaning. Gen -X crew up during the economically challenging 80's and tending to develop more of an isolated lifestyle with value placed on individual expression. Millennial came of age in the midst of rapidly changing technology and want to be part of a cause in making a difference in the world - much more focused on the value to others than the benefit of self. Finally had gotten too much wear. In the deck of Life she was an "Ace"
In teaching us lessons, both "good" and "bad"
Thus we bid adieu, and wish her sweet rest. Dianna & I didn't even meet Dorothy until she was 81 but the last 10 years have been a fun ride. 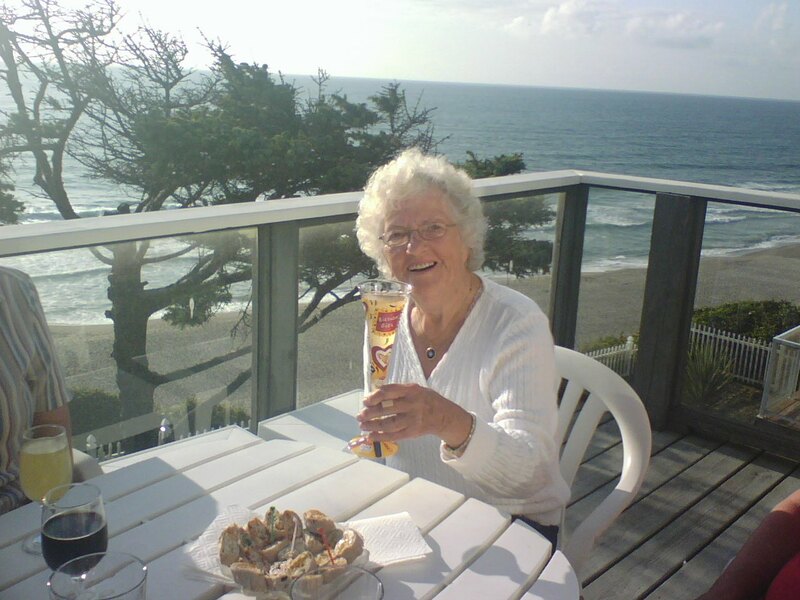 We've been to conferences, workshops, travel outings and celebrations over the years but rarely got to sit with her since she was always looking for new experiences and new people to get to know. One of her most familiar phrases was "Hi, I'm Dorothy, and I'm so glad to meet you", after which she would actively and intently listen and add another recruit to the ever growing club of Dorothy's Friends. She was great at remembering life's milestones and would often call or write with a congratulations, or condolence or thank you. Just 4 weeks ago she sent me a birthday card and the last phone conversation I had with her 10 days ago was a request to join an advisory board for her microlending non-profit she started a couple years ago after being inspired by the work of Muhammad Yunus and the Grameen Bank. This was a woman who parasailed and skydived in her 70's and rode a Harley on her 85th birthday to get her to her 90's, both in age and mph. She was involved in the writing of two books in the last 10 years, "Project Everlasting", a book about the secrets of long lasting relationships that she researched by traveling cross-country in an RV interviewing couples with her grandson Mat Boggs and his friend Jason Miller. She also published a book last year called" 90 Ways to Put a Zip in your Life", and I think she could have turned it into a 26 volume set. 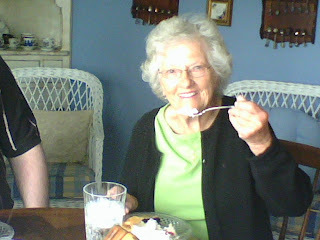 The one place we could sit down with Dorothy was at a pinochle table for a spirited game of cards. A few years ago we were playing 3 handed and after a back and forth bidding frenzy, I passed and smugly said I thought I had most of her suits blocked. 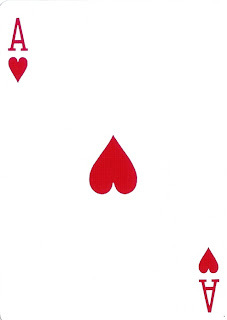 She said, "Now that you've told me what I can't do, let me show you what I can do..", as she turned over the Ace of Hearts in the 3 card kitty and laid down 1000 Aces, which is quite rare in 3 handed Pinochle. That summed up her philosophy life and she definitely walked her talk. Our trip comes to an end with a 48 hour visit to Honolulu. We packed up and bade farewell to Makahuena and headed off to the Lihue airport. With only 6 gates check-in is pretty quick so we had time to eat some sandwiches and play cards while we waited for our flight. When we landed, I rushed off to get our car and returned with a Jeep from Enterprise which had less legroom but more suitcase capacity. We piled in and took the scenic route in to Waikiki where we checked in to the Aston Banyon, on the east end of Waikiki a block from the beach. We had a 1 BR with 3 beds and kitchen on the 33rd floor with a great view of Diamond Head. Mary, Dianna, And I ruched down to catch a sunset and arrived just as it plopped into the ocean and before a rain shower greeted us. Merlin & Mary had stayed in the Hilton Prince Kuhio next door a few years ago, so we picked their restaurant for a meal and were served 1 foot diameter plates of Chinese Chicken Salad, Beef Stew, and Chicken Fried Steak. Fortunately it was a short walk back to our hotel and the elevator was sized for extra capacity. No internet connection was available, so I needed to save up my memories for a recap when I got back to Portland. We had to be up early for our Grayline tour so we bounced out of bed and were picked up by our bus and its driver Ty for a full day of sightseeing. Tickets often sell out for the Arizona Memorial as tourists are shuttled by boat 150 at a time, so we hurried to ge our tickets. The Visitor Center is undergoing a multi-million dollar renovation and is partially open. so we milled arounfd until our 9:20 boat arrived. It was sunny but windy and our visit to the Arizona was sombre and emotioanlly powerful. Eula had lost a chilhood friend, CV Lee Jr. and she found his name in the center of the plaque. We then headed over by bus to the USS Missouri, the site of the signing of the Japanese surrender in Tokyo Bay on Sept 2nd 1945. I had hoped to pick up more of a peace vibe but both the Arizona nad the Missouri resonated with the sense of sadness and loss that war brings. There never seems to be a winner when war is the mindset... We ate at the Missouri and then had a bus tour of Honolulu on the way home including a drive through the National Cemetery at Punchbowl. I had hoped we would stop since my dad had always told an eerie story of their 1984 visit when he sat down after walking the grounds and found we was seated next to a marker for T.J. Ponder. No stopping is allowed these days, so we drove on through and arrived back at the hotel by 3:00. Since we had a car and some wanderlust, we drove out East toward Hanauma Bay but found the $7.50 charge/person a little steep. We worked our way around past scenic visitas to Kailua where we found a Mexican restaurant as a change of pace. We had a good meal and still made it back in time to catch a sunset by coming back on the Pali Hwy. We came home and started pre-packing before some card-playing. When everyone went to bed, I decided to stroll around Waikiki since it was only 9:00 and it gave me a little more sense of the Waikiki nightlife. I'm definitely more of a Kauai lifestyle kind of guy. Morals abound as in the "Better Butter Battle"
It's now apparent the downside of giving me a little too much free time and a self-imposed goal of recapping our activities here on vacation. However, I've rarely met a theme I couldn't twist for my own enjoyment, so don't expect things to return to normal even though the vacation is ending... Since this week marked the 106th birthday of Theodore Geisel (aka Dr. Seuss) and a number of school activities were planned to celebrate reading, I thought I would offer my own tribute. Geisel was challanged to take a list of 250 words to create a book kids would be eager to read, and the resulting "Cat In The Hat" energized generations of readers, myself included. His rhyming pattern was anapestic tetrameter while I lean more to the simpler anapestics of the limerick style. Actually got to come face to face with rain today a few times as we headed up to Elsie's with a treasure trove of unused food. I was able to get in the car before a squall soaked the Gang of Four but by the time wereached Lihue, the sun was emerging. Elsie had a church activity today that ran longer than she expected, so we missed her and dropped our food off in exchange for a last batch of fresh oranges. We did our final shopping at Hilo Hatties and dined at Costco before heading home. Dianna & Mary wanted to check out the shops in Koloa, so as designated driver I went with them and then stopped at the Hyatt where I was able to get a few blog-ready photos including a rainbow that preceded another intense rain shower which I got to soak in. We had a whitefish (not red or blue) and two corn dish meal with dinner rolls as we cleaned out the refrigerator and then caught a nice windy sunset. Played cards and then prepared to pack up tomorrow for a 2:00 PM flight to Oahu. And we even got a cover photo for Hawaii Surfer mag. The Kilohana Plantation had an hour long train ride around their grounds, so we hustled up to ride the rails. We passed through a variety of exotic tropical orchards and plantings and stopped to feed the wild pigs. The scene was reminiscient of the rush through some of the food lines at the Smith Luau we attended last week. At the conclusion of the ride we headed down to Port Allen to visit Kauai Chocolate under the guise of doing reseach for Ted and then picked up some coffee at the Kauai Coffee Company store. We stopped for a quick photo-op of Eula surfing in the mist and then headed home to resume the task of trying to empty the contents of our refrigerator before we pack up Friday morning. More shrimp, pork, fish, corn casserole and salad was consumed, but we're not making enough of a dent. "Some watched while others must sleep", as we played some cards and watch the Duke-Maryland game before arriving at dinnertime with no appetites. Their was no sunset to view to speak of, so we passed the early evening with a series of Back Alley games and a Five Crowns match. Week One gave us our sun so to be fair Week Two is about air... We started the day with some excellent crab omlets and hash browns prepared by Merlin and then plotted our course for today. All we knew was that we'd be tacking into the wind as once again the day dawned cloudy and windy. My chore of the day was fixing the condo complex's guest computer which would entail a visit to the East side of the island, and we wanted to visit some of the great waterfalls on the island. We found the Computer Hospital in Kapaa and I had an enjoyable conversation with the owner. He wants to sell his business due to health problems but one computer business on my resume is enough for me although based on the level of support I've found so far, a guy could stay busy.. The Wailua River, home of the Fern Grotto and adjacent to Elvis's famous Coco Palms ( which sadly has fallen into complete disrepair since Hurricane Iniki in 1992) has a beautiful waterfall named Opeaka which has a view easily accessible off the roadside. 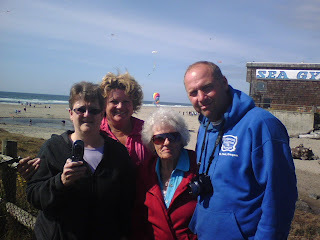 We enjoyed the scenery and snapped a few photos including one of a parasailor on the beach at the mouth of the river. We then headed off to Wailua Falls, an impressive 80 foot falls made famous in "Fantasy Island" The flow was only moderate due to lack of rain but beautiful just the same. We returned home for lunch and I headed to the office and installed the new network card, loaded IE 8.0 and was relieved when a connection was established. I was given mahalo and fresh avacados, a variation of the country doctor taking chickens for service... although finding a chicken on this island wouldn't have been a problem either. Played some cards and then Dianna & Mary went for a nice round-trip walk to Brenneke's and then we prepared dinner. Pork chops, corn casserole, and salad greeted us after a quick sunset viewing followed by an evening of spirited Back-Alley card playing. I prepared another batch of cinnamon rolls and deferred the blog entry until morning. Aging nearly hairless breed of Northwest Liberal residing in SW Portland near Hillsdale. A Stanford engineer embracing computers in the 1970's. project management in the 1980's, the Internet in the 1990's,and Energy Efficiency & Sustainability from 2001 forward. Enjoy long walks and short talks, farmers markets and folk music. Appreciate the power of community activism and individual initative.